We present further steps in our analysis of the early anthropogenic hypothesis (Ruddiman, Clim Change 61:261–293, 2003) that increased levels of greenhouse gases in the current interglacial, compared to lower levels in previous interglacials, were initiated by early agricultural activities, and that these increases caused a warming of climate long before the industrial era (∼1750). These steps include updating observations of greenhouse gas and climate trends from earlier interglacials, reviewing recent estimates of greenhouse gas emissions from early agriculture, and describing a simulation by a climate model with a dynamic ocean forced by the low levels of greenhouse gases typical of previous interglacials in order to gauge the magnitude of the climate change for an inferred (natural) low greenhouse gas level relative to a high present day level. We conduct two time slice (equilibrium) simulations using present day orbital forcing and two levels of greenhouse gas forcing: the estimated low (natural) levels of previous interglacials, and the high levels of the present (control). By comparing the former to the latter, we estimate how much colder the climate would be without the combined greenhouse gas forcing of the early agriculture era (inferred from differences between this interglacial and previous interglacials) and the industrial era (the period since ∼1750). With the low greenhouse gas levels, the global average surface temperature is 2.7 K lower than present day—ranging from ∼2 K lower in the tropics to 4–8 K lower in polar regions. These changes are large, and larger than those reported in a pre-industrial (∼1750) simulation with this model, because the imposed low greenhouse gas levels (CH4 = 450 ppb, CO2 = 240 ppm) are lower than both pre-industrial (CH4 = 760 ppb, CO2 = 280 ppm) and modern control (CH4 = 1,714 ppb, CO2 = 355 ppm) values. The area of year-round snowcover is larger, as found in our previous simulations and some other modeling studies, indicating that a state of incipient glaciation would exist given the current configuration of earth’s orbit (reduced insolation in northern hemisphere summer) and the imposed low levels of greenhouse gases. We include comparisons of these snowcover maps with known locations of earlier glacial inception and with locations of twentieth century glaciers and ice caps. 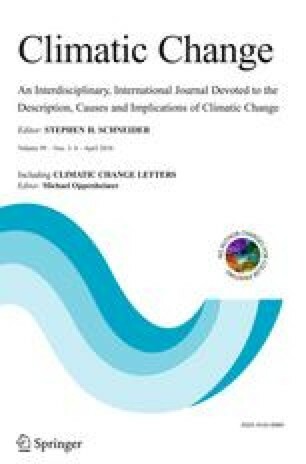 In two earlier studies, we used climate models consisting of atmosphere, land surface, and a shallow mixed-layer ocean (Ruddiman et al., Quat Sci Rev 25:1–10, 2005; Vavrus et al., Quat Sci Rev 27:1410–1425, 2008). Here, we replaced the mixed-layer ocean with a complete dynamic ocean. While the simulated climate of the atmosphere and the surface with this improved model configuration is similar to our earlier results (Vavrus et al., Quat Sci Rev 27:1410–1425, 2008), the added information from the full dynamical ocean is of particular interest. The global and vertically-averaged ocean temperature is 1.25 K lower, the area of sea ice is larger, and there is less upwelling in the Southern Ocean. From these results, we infer that natural ocean feedbacks could have amplified the greenhouse gas changes initiated by early agriculture and possibly account for an additional increment of CO2 increase beyond that attributed directly to early agricultural, as proposed by Ruddiman (Rev Geophys 45:RG4001, 2007). However, a full test of the early anthropogenic hypothesis will require additional observations and simulations with models that include ocean and land carbon cycles and other refinements elaborated herein.